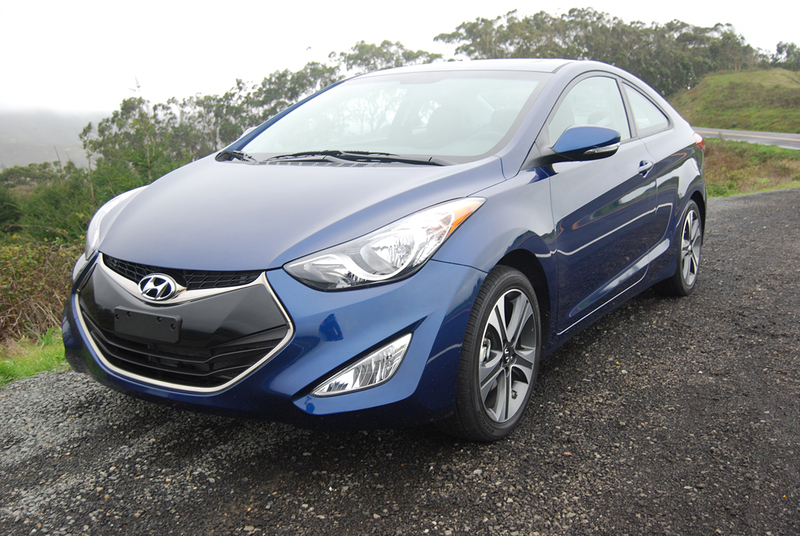 Easy on the eye, easy on the wallet, the coupe version of the Elantra dishes out a pretty good trip down easy street. Hyundai hasn’t done an Elantra coupe before, so if you wanted a personalized two-door from this Korean maker, their Genesis coupe was the only model available. But opting for a Genesis meant spending more ($24,250 – $34,250), fueling more (21 MPG City/30 MPG Highway), and giving up front-wheel-drive traction for rear wheel-drive fun. 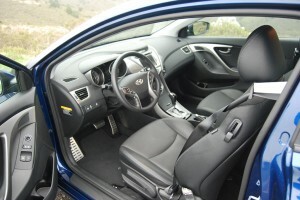 The new Elantra two-door checks in at a base price of $20,745 ($23,965 loaded with $2,350 woth of Navigation), posts significantly better mileage figures than the Genesis (27 MPG City/37 MPG Highway), and powers the front wheels rather than the rears. And despite the fact that it offers only 2 doors, they open wide enough to make access to the back seat easy. Since that back seat folds flat, this diminutive, 2,661 lb. coupe totes baggage as well as 4 passengers. The SE shares many of the same facial features as the redesigned Genesis coupe. The smile of the grill, the sparkle of the headlight jewelry, the rising character line from front to rear are Hyundai-specific styling cues that distinguish the brand. 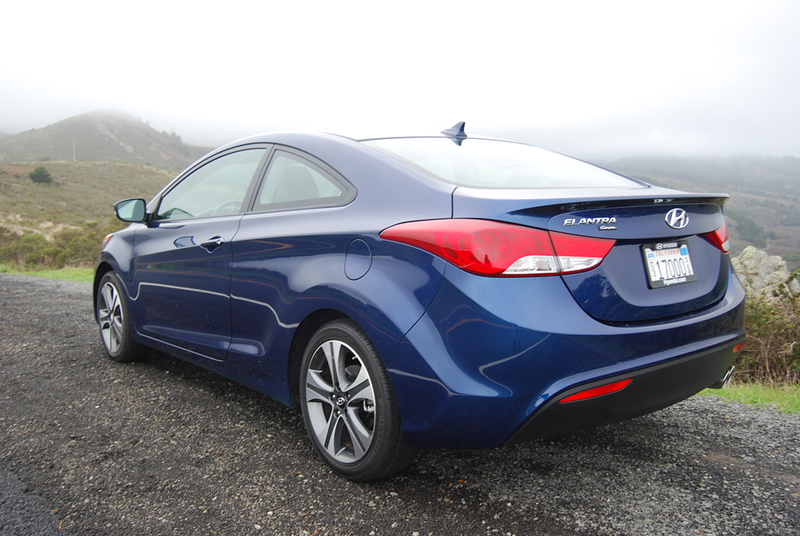 The Elantra is handsome in a fresh-faced, breezy Abercrombie sort of way. It will appeal to style-conscious first time buyers who want to look sporty without paying a price in ride discomfort or lack of practicality. Given the coupe’s modest power output of 148hp, however, you’ll soon discover that the SE looks a lot more sporty than it behaves. Our test car’s standard 6-speed automatic SHIFTRONIC gearbox offers fully automated shifting, plus manual gear selection through the console-mounted stick. Hyundai does not provide steering wheel paddles for this chore. The manual shift provision is useful only to a point: no matter what gear you’ve selected, the SHIFTRONIC will automatically upshift to the next higher gear at 5,500rpm. It does so despite the fact that engine redline begins at 6,700rpm. 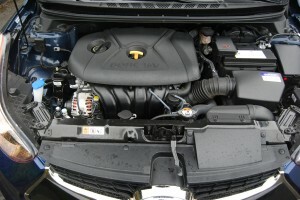 Even so, you’ll want to avail yourself of manual gearbox operation to extract maximum oomph from the 1.8 liter inline 4. The premium suspension and tire fitment beg for more engine vitality. Hyundai has selected sporting spring and swaybar dimensions for the coupe, and fitted 215/45R17 Hankook Optimo tires on striking split spoke alloy wheels. But you’ll rarely put this vibrant combination to the test due to power limitations under the hood. Inside the roomy cabin, the coupe looks more expensive than competitors’ products like the Honda Civic and Nissan Sentra. The perforated seating surfaces are made from leather and standard fitment. The front passenger seat is ingeniously designed to slide and tilt forward when a latch on its back is released. This enhances back seat entry/exit. A B-pillar mounted front seatbelt retainer folds out of the way as well. Hyundai engineers have clearly devoted themselves to the human dynamics of loading and unloading this coupe’s back seat. The low roofline, however, limits rear occupants to 5’8” in height. You would expect to find a few rough edges in a car of this price class, and the SE doesn’t disappoint in this regard. The multi-function steering wheel includes spoke-mounted buttons to control voice activation of the standard 360 watt Infotainment system plus cruise control. The inner edges of these buttons are so sharp they will snag your hand when touched. Likewise, the tail lamps on the rear fascia harbor knifelike edges when the trunk is open. An examination under the trunk mat reveals an aerosol flat fix bottle but no spare tire. Despite these minor sins of omission and quality, the Elantra coupe is a solid bargain in this price range, and would make an excellent first car for a anyone leery of spending much time at a gas station.